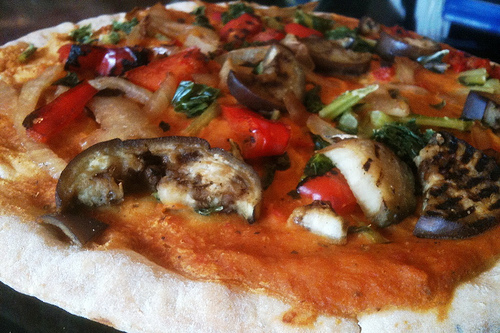 This post is filed under Eggplant, Frozen, Kashi, Peppers, Pizza, Reader Submission, Tomato Sauce. Actually this is supposed to be cheese-less. If you notice the large “No Cheese” label above the protein and fiber count. My guess is that its vegan as Kashi likes to cater to that crowd. I understand that they’re judging foods as they come out of the box, but even with microwave meals, I almost ALWAYS end up adding seasoning and whatnot to taste. It’s a no cheese pizza!!!! The actual picture looks somewhat decent on the overall scale of food, and pretty damn amazing for frozen food. 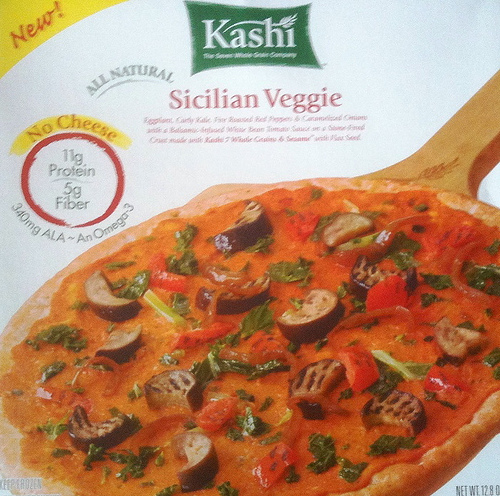 I’d like to see more reviews on Kashi products, in part because they’re supposed to be healthier than others.